Seattle Mayor Ed Murray’s proposing a radical new way to measure street performance. It’s not what you’d expect. Seattle can no longer deny it’s engaged in a war on cars. Mayor Ed Murray’s new growth plan is a shock-and-awe campaign targeting anyone who dares to drive in, through or around Seattle. Over the next 20 years, Seattle will aggressively convert street right of way to non-vehicular use, discourage creation of parking capacity as the city grows, and minimize parking at public parks, limiting their accessibility. It may also toll streets to pay for such improvements. But the most radical change is Murray’s plan to stop using congestion as the criteria for whether streets are performing. Under a novel standard proposed by Murray’s transportation department, street performance will be ranked by how many single-occupant vehicles (SOV) are using them. Streets with fewer cars will be ranked as the best performing, because Seattle’s priority going forward is to reduce car usage. So a street may be ranked as performing well, even if it takes an hour to drive a mile, as long as it has a good mix of buses and bikes. If approved by the City Council, this approach will influence decisions on where to improve or reduce street capacity for cars. It will also affect the city’s negotiations with big developers, to mitigate the effect of their projects. Most of all, this shift gives the finger to those who drive cars, meaning nearly all residents and businesses. The vast majority of travel will continue to be done by car because driving in Seattle is an unavoidable part of work and life for most people in the region. Seattle needs to think bigger. As the state hub of commerce and culture, its streets are critically important to millions of people, most of whom don’t have the option of riding a bus or a bike instead. 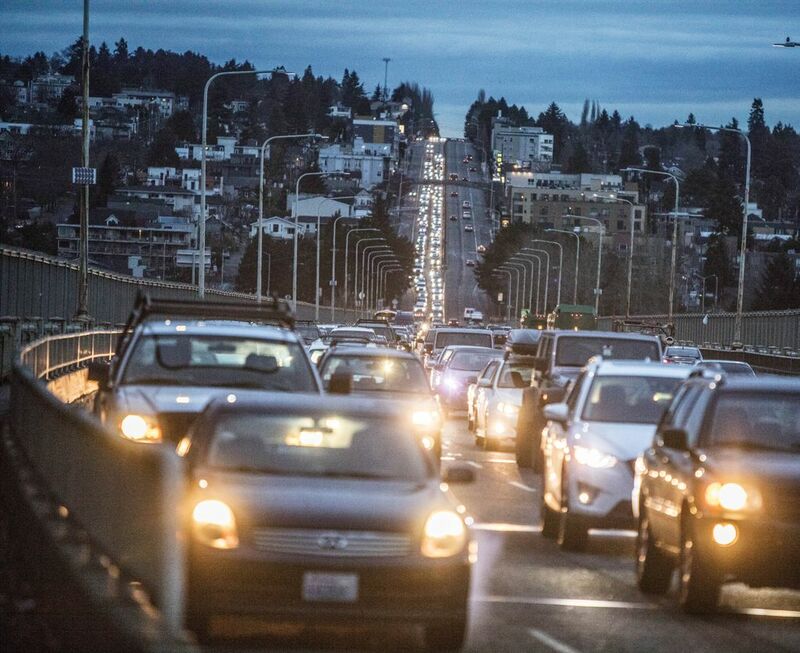 Personal cars were used for 82 percent of trips in the Puget Sound region in 2014, down slightly from 86 percent in 1999, according to the Puget Sound Regional Council. City Hall’s plan doesn’t reflect that reality. Nor does it fulfill promises made to city dwellers by the state Growth Management Act of 1990 — the original grand bargain. In return for accepting density and preserving rural areas, urban residents were promised infrastructure that would keep up with the growth. To ensure streets aren’t overloaded, cities must use level-of-service standards to grade performance. If streets fail, cities can limit development until improvements are made. The act also authorized cities to collect impact fees for upgrades, so growth paid for growth. But Seattle officials scoffed that such tools were for lowly suburbs. That policy decision favored developability over livability. Still, Seattle measured streets’ performance, counting traffic at key points. It will continue but the counts will be fed into a model that estimates the ratio of trips made with cars. The city theorizes this ratio indicates congestion, because it believes cars are an inefficient use of streets. Why not model the ratio for informational purposes, but use traffic volume and speed for the performance standard? That’s what most people equate with congestion. That also makes it a priority to reduce driver delays. The federal government estimates travel delays cost people $17 to $24 per hour. King County consultants estimated additional rush-hour delays of 1.5 to 14 minutes downtown would cost drivers and bus passengers $75 million a year. Then there’s the cost to industry, from shipbuilding to exporting produce from farms across the state. More than 21,700 jobs and $3.6 billion in economic output will be lost if congestion increases 20 percent in the central Puget Sound region, according to a 2014 state study. Congestion also hurts Seattle’s cultural vitality. Arts organizations are losing patronage as people give up trying to drive and park in the city. There aren’t enough close-in residents to support all the arts, clubs and eateries. They must draw people regionally. Because Seattle streets are of statewide importance, other governments should keep the city focused on actual congestion. Don’t count on it, though. “We don’t have authority over that — state law is very vague,” said Charlie Howard, PSRC transportation director. The state Department of Commerce helps cities write growth plans but can’t reject them. It advises cities that service standards are meant to translate public expectations for street performance into measurable goals, while accounting for the impact of growth. Street standards need to evolve. A 2005 growth-act update encouraged new standards factoring transit. But it says growth hubs must still measure streets’ level of service. Proposed federal standards will measure greenhouse gas emissions, in addition to actual travel times, congestion and reliability. Seattle’s going its own route. It says single-occupant vehicles are inefficient so reducing them improves level-of-service. That’s debatable. Worst of all, City Hall’s assuming that driving is optional — a lifestyle choice — and it can force people to change how they live. Ugh. Seattle’s better than that.